An exploration of the practice of samatha, the style of meditation devoted to focus and attention. Geshe Sopa continues his elucidation of Lama Tsongkhapa's masterwork on the Buddhist path with an explanation of the core meditative practice of samatha, or calm abiding. Showing how it is absolutely essential for--and goes hand in hand with--the achievement of insight into reality, he gives practical tips for countering sleepiness, agitation, and their more subtle counterparts. 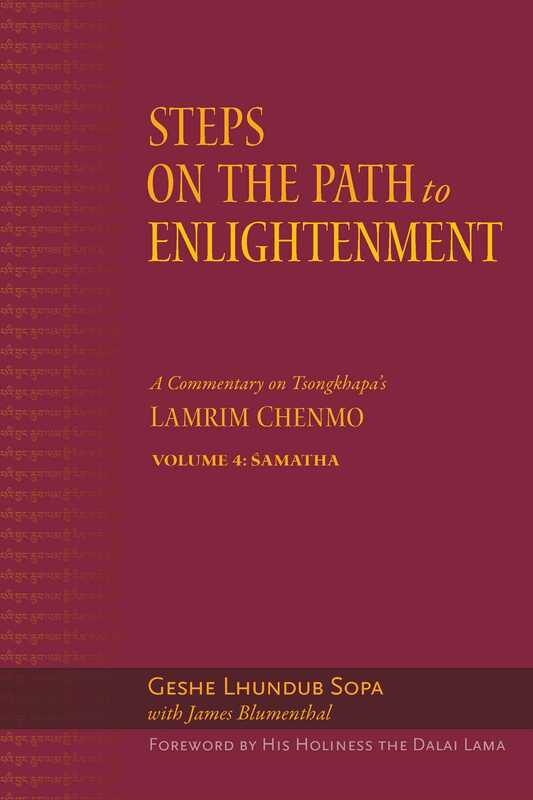 Leading us step by step toward deeper levels of concentration, volume 4 of the Steps on the Path to Enlightenment series brings readers closer to the ultimate goal of samatha: unlimited and effortless focus.